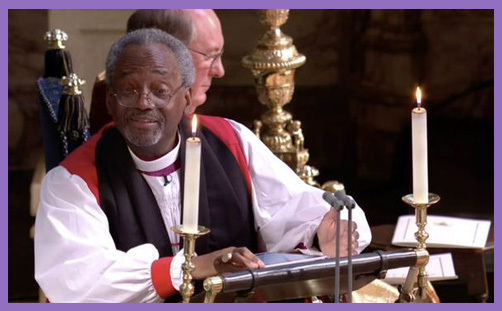 Bishop Michael Curry’s wedding address – or the US preacher’s Royal Wedding sermon (as he and it shall henceforth be known) in the marriage service of Prince Harry to Meghan Markle – has fast become the most talked-about homily (for that is what it actually was) in the history of preaching. Just google it: it’s all over the BBC, CNN, The Guardian, Fox News and Teen Vogue. it’s even made BuzzFeed. Yes, there’s Christian preaching in BuzzFeed. It wasn’t intended to be a sermon of dogmatic theological instruction, for the event was a wedding. It wasn’t conceived as an exhortation to corporate penitence with an altar-call to receive eternal salvation, for the occasion was a celebration of marital love and the power of love. It was a wedding address to edify first and foremost the bride and the groom: a Royal Wedding sermon to inspire their hearts and (in passing) touch two billion attendant souls with the fragrance of Christ. Jesus, what a missed opportunity. This so-called messiah trundles down to a wedding in Cana of Galilee, and what does he do? A conjuring trick with grapes! Honestly, this pathetic so-called prophet has a captive audience of hundreds just ripe to hear the gospel, and he gives them instead gallons upon gallons of of wine and a distorted messianic message. What kind of inebriating witness is that? He never mentioned sin or repentance once; never mentioned the reality of hell or the need for salvation. “My hour has not yet come,” he bleated. What a feeble excuse is that for not denouncing adultery, drunkenness, greed or gays. And don’t give me all this ‘It revealed his glory’ tosh: it was just messianic mush; it might have convinced a few disciples, but what about the hundreds of lost souls who needed to be convicted of their sin and fall on their knees in repentance and receive him as their personal Lord and Saviour? This way of love, it is the way of life. They got it. He died to save us all. He didn’t die for anything he could get out of it. Jesus did not get an honorary doctorate for dying. He didn’t – he wasn’t getting anything out of it. He gave up his life, he sacrificed his life, for the good of others, for the good of the other, for the wellbeing of the world … for us. But don’t read this Royal Wedding sermon, as the Archbishop of Canterbury exhorted: it needs to be watched and heard, for the medium is the inspirational message. And those who have ears to hear will do so, and they will understand the essence of the mission. Others will carp and carve it up, and then they’ll condemn and criticise it because it doesn’t quite conform to every jot and tittle of their own theology or soteriology. It is all about faith, hope, and love, but the greatest of these is not expository dogmatism.